One of the most significant hazards of cooking in the kitchen is that you are almost guaranteed to make a bit of a mess, especially when cooking with oil. If you’re not careful when cooking, you can quickly end up with unsightly cooking oil stains on your favorite pair of pants or shirt. If you happen to discover grease or oil stains on your clothes, don’t panic. There are a variety of standard everyday products that you have at home that you can use to remove grease and cooking oil stains from your clothes, so they look new again. Getting a splash of grease from the frying pan on your shirts shouldn’t turn into a laundry nightmare. Grease stain removal can be much easier to deal with than other types of stains because you can break down oily substances with washing up liquid like laundry detergent or dishwashing liquid detergent. Find out how to remove grease stains in cotton and other fabrics. Just remember, the faster you can treat an oil stain, the better the results. This method is handy for removing grease from fabric. Apply a small amount of liquid laundry detergent directly to the stained area. Using your fingers, rub the detergent into the stain. Check the care label on the item and wash the clothing in the hottest water recommended for the material. Before drying, make sure the stain is completely gone. 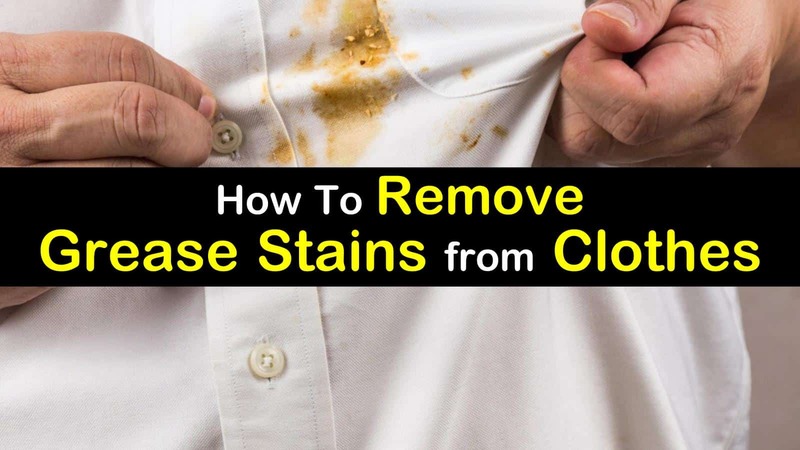 If the stain remains, you’ll need to repeat the process or try the method outlined below. While you always want to use a washing detergent designed to clean clothes, if you have a really stubborn cooking oil stain, the grease fighting properties in liquid dish detergent can work well, especially on stains caused by cooking oil. To get an oil stain out place the garment flat on a counter and cover the stain with dishwashing detergent. Using your fingers, gently work the detergent into the stain. The stain should begin to dissolve immediately since most dish soap can directly absorb grease. Rinse the dish soap off and wash as usual. Polyester is relatively stain resistant, but if you spill oil or grease on it, you will end up with an unsightly blemish. Fortunately, polyester is much easier to clean than natural fibers so to get a lipstick stain out of a polyester shirt is easy and requires a few simple steps. Start by moistening the stained area with warm water. Next, place a small amount of liquid detergent, like Dawn, over the stain. Work the soap into the stain with an old toothbrush. Rinse the area with cold water and check to see if the stain is gone. Once you remove the stain, you can wash the garment with regular laundry detergent. It’s probably pretty safe to say that everyone at some point has ended up with a grease stain on their favorite pair of jeans. Before you give up on your jeans and toss them in the garbage, try these natural DIY remedies to remove oil stains from your jeans. To have the best results with these oil stain removal methods you want to first blot the stain with a paper towel or other absorbent cloth. Be sure to avoid scrubbing the stain as it will push the oil further into the fibers making it harder to remove. Believe it or not, hairspray is a great stain remover when the stain is oil based. If you are out and about and end up with a grease stain on your clothes, you can use hairspray to take care of oil stains on clothes. All you need to do is soak the stain with hairspray and let sit for at least ten minutes. Afterward, use a damp cloth and dab the area until the stain disappears. When you get home, you can throw them in the washing machine and launder as usual. Here’s how to get grease stains out of pants using baby powder or talcum powder. If the stain is fresh, you can soak up the grease by sprinkling the powder of the area. The baby powder acts a lot like baking soda in that it will effectively keep the oil from sinking deeper into the fibers of the clothing. Leave the powder on the pants as long as possible to soak up the oil then brush it off. If the stain is still visible, use one of the methods above to eliminate the stain. Some of the trickiest stains to remove from carpet are oil stains. It can be a challenge to get oil that has already soaked into the fibers of the rug. Since oil isn’t permanent, you can quickly remove it with a few simple steps. Take a clean cloth and apply a small amount of rubbing alcohol. Make sure that the area that you are using the rubbing alcohol is well-ventilated because it is toxic and flammable. Press the rubbing alcohol-soaked cloth into the stain on the carpet. Rubbing alcohol is a solvent and will help dissolve the oil and separate it from the fibers of the rug. Allow the area to dry. Once dry, check to see if the stain is gone. If you were able to remove the stain successfully, you can then rinse the area with water and blot dry. On more resistant carpet you can use paint thinner to get grease stains out. See details removing grease stains from car carpet here. You can also use a commercial dry cleaning solvent to remove oil stains from carpet. Before using this method, be sure to test the product on an inconspicuous area to ensure it won’t leave a stain or remove the color from the carpet. Apply the dry-cleaning solvent to the affected area of the carpet. With a paper towel or clean cloth, press the solution into the stain. Start on the out edges of the stain and move inward toward the center. Allow standing for five minutes before blotting up the residue with a damp cloth. Repeat the process if necessary. Spilling cooking oil or grease on your clothes or carpet doesn’t have to be the end of the line. With these simple tips and tricks, you can remove even the toughest oil stains from any fabric with everyday products that you probably already have in your home. Don’t throw away clothes that are stained with oil, instead, utilize these spot removal techniques and get your clothes looking new again. 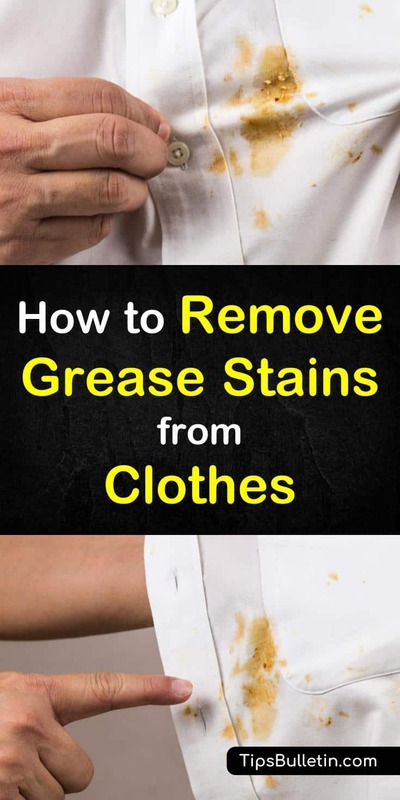 We hope you enjoyed learning about how to remove grease stains from clothes. If you found this information useful, please feel free to share it with your friends and family.